How do you express your love to your loved one in the coming Valentine’s Day? A bunch of flowers? A box of chocolates? There are better more practical things to show love. 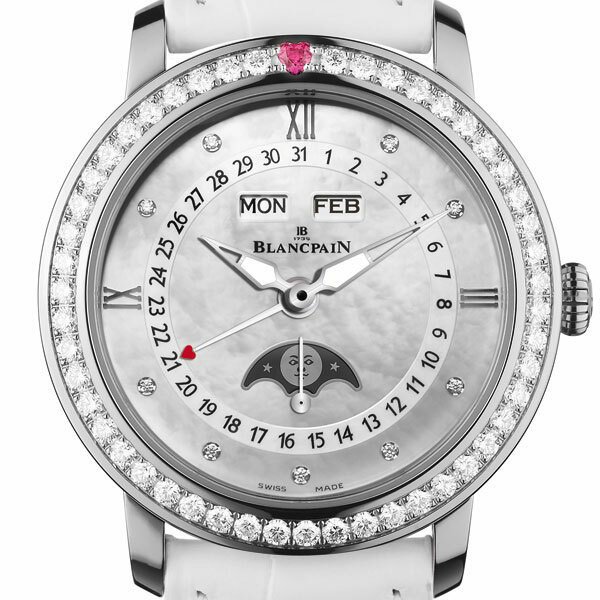 Blancpain provides a nice option for you, the Saint Valentin 2011 Watch. 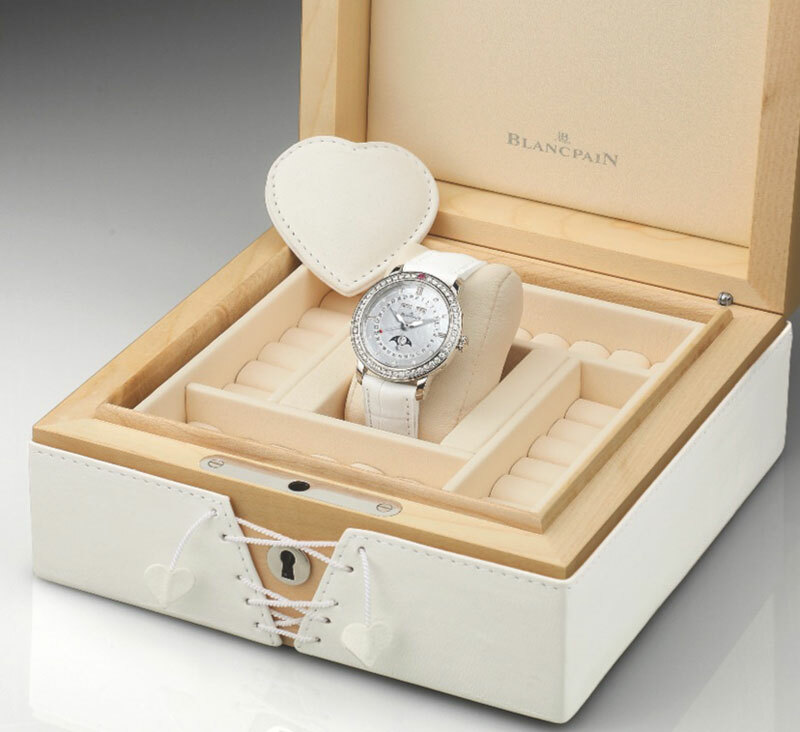 To be unveiled at SIHH 2011, the new Blancpain Saint-Valentin timepiece marries the classic features of a modern-day watch with the characters of love, making this a startlingly beautiful watch and a perfect gift. Judging by the looks of it, the new model is based on the Complete Calendar Ref. 3363-4544-55B model that was created for the same occasion three years ago. At least, it comes in the same stainless steel case 34 mm in diameter and 11.05 mm in height, and is powered by the same manufacture-made BP Calibre 6763 automatic movement. Produced by Blancpain’s subsidiary Frederic Piguet, the movement is composed of 261 parts. 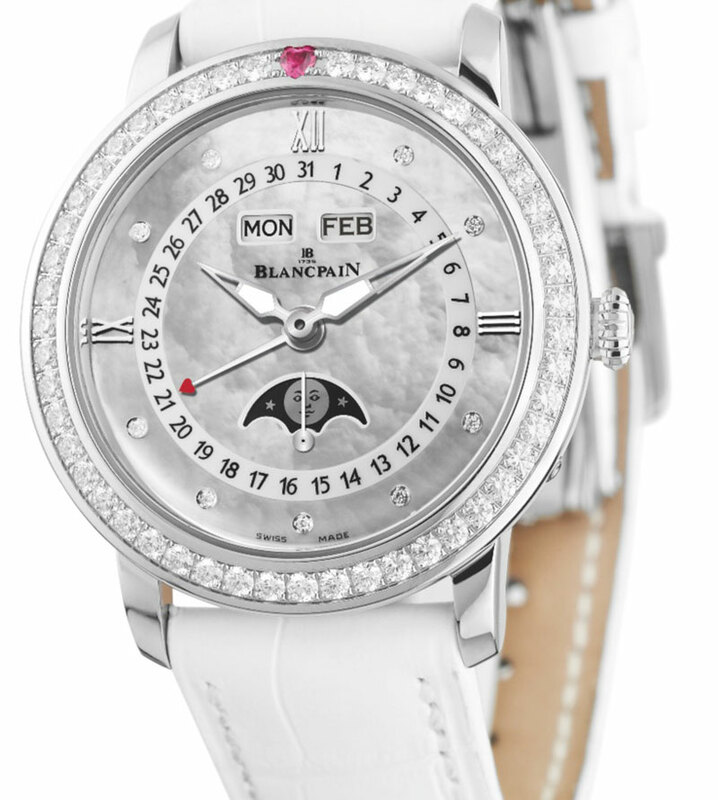 The Saint-Valentine 2011 watch is very classic in style, and even the iconic Blancpain features are subdued. The watch is a triple calendar style with moon phase. Meaning it has an annual calendar complication, the time with a subsidiary seconds dial and a smiling moon phase indicator. The watch is mostly white in tone, with a 35mm wide steel case, bezel lined with 49 diamonds, more diamonds on the mother-of-pearl dial, and two hearts. No Valentine’s day watch can resist the inclusion of red hearts. The first is used as the hand on the date indicator dial on the watch face, and other other is a bit higher-end on the luxury scale being a heart-shaped ruby located on the bezel at the 12 o’clock position.